"Our students ask: what are we to do? And for those of us who don't know what to say, Awake shows us what we must do, and how we must do it. And we must do it now! We are all at Standing Rock: if we do not act to protect Earth now, who will?" "Fear stops many an incipient movement cold. Not Standing Rock. By taking the viewer inside the participants' marches, discussions, and confrontations, this cinematically stunning account brings us face-to-face with the activists' theme: 'We defeat fear every day.'" 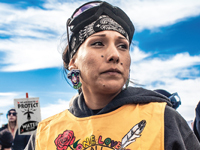 "An essential watch...Provides an insider's view of what happened at the Standing Rock protests...Compelling videography and heart rendering voices explain the meaning and context of the Water Protector's actions. This film is easy to add to any classroom because it is segmented into 4 stand-alone parts. Highly recommended." "Compelling...Provides a nuanced, complex portrait of contemporary indigenous activism...A moving look beyond the headlines and an excellent discussion starter for high school and mature middle school students interested in media studies and contemporary activism." "The film makes clear that both the Democrats and the Republicans were complicit in allowing the pipeline construction to continue...The struggle will continue as local committees against the pipeline and fracking in general have sprung up everywhere." "Awake allows us to experience the pain of the Standing Rock people as the Dakota Pipeline is built in their midst. We see them fight a battle between 'greed, fear, money, violence, hate, and oil' and 'generosity, faith, freedom, peace and water.' We hear their anguished voices, we witness their helpless suffering, and we wonder what will become of their way of life." "Awake is a timely introduction to how national movements can coalesce around the kinds of important stories we struggle to adequately share across any one spectrum of communication. The power of storytelling in this context inherently promotes the mobilization of knowledge to do work for not only those directly affected communities, but for anyone who demands that how we share information is more relevant and accountable." "Standing Rock was a milestone in the efforts on behalf of indigenous people all over the world toward conservation of the Earth' resources for all of us...Watch this well-produced documentary." "The fight continues, with two sides locked in court battles, even as oil currently flows through the pipeline...This is a valuable tool for discussions about environmental issues and the Native-led defiance against the project." "AWAKE is a lovely meditation on the importance of place, spirituality, and community for modern Native Americans. It is also a sobering reminder that dispossession and injustice at the hands of governments and private interests, so much a part of Native America's past, continue to this day. Future environmental activists will find it an inspiring example of peaceful organizing for resistance and change." "The film will spark discussion of indigenous rights, and whether law enforcement is skewed toward protection of corporate interests to the detriment of said rights. The film is highly recommended to support curriculum in the following fields: law enforcement; human rights; environmental, peace, policy, and ethnic/Native American studies; also, broader social sciences curriculum such as anthropology and sociology would be well-served, as would law school students studying constitutional law." One gene exposes a nation's dark past. A Navajo couple with two children born with an extremely rare genetic disorder investigate the cause of the outbreak. "The film is useful to teachers with a 'radical' commitment to addressing the present, and facing mainstream inequalities head on...Provides a powerful framing for the local and national issue of clean water access, bringing it from a headline to a reality. Above all, this film represents the heart of movement building - deep and sustainable connections with community. Awake is a film to share with our students across learning modalities as an inspiring example of contemporary resistance work."